Prepaid Maintenance Included at Santa Margarita Toyota! The 2019 Toyota Camry is a midsize vehicle offering a vast array of amenities, stylish cabin and intuitive infotainment system. Available trim levels include: L, LE, SE, XLE and XSE. It’s powered by a 2.5 liter four-cylinder engine with an output of 203 hp paired with an eight-speed automatic transmission. Buyers who want more power may want to opt for the 3.5 liter V6 engine with an output of 301 hp. The interior offers seating for five passengers and comes with cloth seats. Optional seating features include synthetic or genuine leather seats and temperature controlled seats. Two full sets of LATCH connectors are in place. Standard interior features for the 2019 Toyota Camry include a 7″ screen, a USB port, Bluetooth connectivity, stereo system with six speakers, adaptive cruise control, automatic high beams and lane keep assist. Available optional features include a moonroof, push-button start, automatic climate control, a 8″ touch screen, premium JBL audio system with nine speakers, a 360-degree camera and more. The infotainment uses buttons and knobs making it easy to adjust settings in multiple ways. Cargo space stands at 14.1 cubic for the base model while other models have 14.1 cubic feet. Available safety features include air bags, brake assist, ESC, daytime running lights, traction control and more. 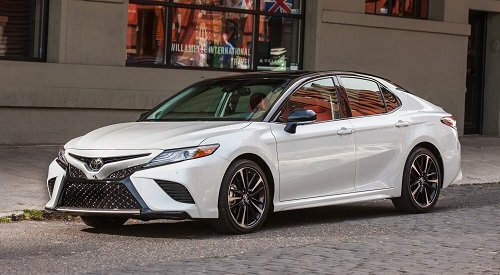 View our stock of 2019 Toyota Camry in Orange County, CA below.